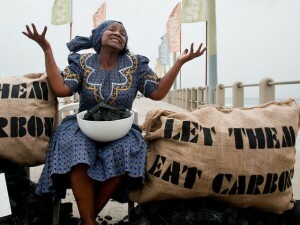 Photo courtesy of WWF International Photo Coverage for Climate COP17/flickr. DURBAN, South Africa (14 December, 2011)_The climate change conference held in Durban, South Africa had not ended yet, and we already heard the chorus of denunciations: “The agreement is too weak”, “The governments have failed us again”, “Why don’t they get it? Shame on them!”. There is truth to these comments. As a head of a delegation said in the last Durban plenary session, “I have never seen a climate change agreement I have liked”. I share the sentiment, having attended and participated in most of these Conferences of the Parties (COP) of the United Nations Framework Convention on Climate Change (UNFCCC) starting from the first meeting in Berlin in March 1995. Indeed, I have been in this process a total of 20 years now as I started following it in November 1991 (during the negotiation of the UNFCCC itself) when I decided to choose the obscure topic of ‘global warming’ as the subject of my doctoral dissertation at Yale Law School. Concluding that the Durban results are inadequate or even bad does not mean they should be rejected. This explains why many countries, including our delegation from the Philippines, in the final plenary early morning last Sunday (after a 36-hour extension as the conference was supposed to end on Friday), stated they were unhappy but still agreed to adopt the package. Governments cannot and should not leave these climate change conferences without a result; to do so, as we did in Copenhagen, would damage, even doom permanently multilateral efforts to address climate change. To use the language of negotiation experts, there is no ‘best alternative’ to an agreement in the case of the UNFCCC process. That is why one should always aim for the maximum, not the least, common denominator; if you don’t aim high, there is no choice but to consent to the low. Walking away, we learned in Cancun, is not an option. But are the Durban agreements — on a platform/process to negotiate a new legal agreement, the extension of the Kyoto Protocol, the agreements on long-term cooperative action (LCA), and the creation of the Green Climate Fund — really as bad as they are being portrayed? I disagree. I will be publishing in January/February a comprehensive analysis of the outcome of Durban and my reflections as the REDD-plus Facilitator on what worked in our negotiations. My preliminary analysis however is that that in fact we made progress in Durban. Durban Platform for Enhanced Action — an agreement was reached to negotiate a new agreement (mainly on mitigation with higher ambition); the negotiations would be launched in June 2012 and will aim to finish by 2015 so that the new agreement will be in effect by 2020. There was also an agreement that the result of this negotiation would be “a protocol, any other legal instrument, or instrument with legal force”. Kyoto Protocol — a second commitment was agreed for the remaining parties to begin on 1 January 2013 and end either on 31 December 2017 or 31 December 2020, subject to decision in next year’s meeting. Parties will offer their reduction targets by May 2012. A decision on the LULUCF rules was also adopted by the Meeting of the Parties. LCA Agreement — Most of the LCA agenda has been dealt with and so it will be extended only one more year. Adaptation, Technology Transfer and REDD are nearly done and can be implemented. Long-term finance and the proposed agriculture research program clearly needs more work. Green Climate Fund — its governing instrument was adopted in COP17 and it will now be created in the next 12 months. The Green Climate Fund is a clear advance; for the first time, we have a large multilateral financial institution outside the Bretton-Woods institutional framework where developing countries have at least 50% of the board and which will receive guidance from the COP (the majority of members comes from developing countries). The question is how much real money it will have and whether adaptation will be financed significantly. The LCA agreement is actually good — not perfect, still incomplete, but much better than expected. Dan Reifsnyder of the United States did a great job as Chair; after a stormy start in Bangkok in April, he managed to run a fair, open and transparent process. As expected, adaptation and technology transfer advanced while some issues like long-term finance and the agricultural programme still need work. Unfortunately the latter is very general and will have to be developed next year. As part of the LCA agreement, governments moved forward on Reducing Emissions from Deforestation and forest Degradation (or REDD-plus) with an agreement that is good for people, forests and climate. In the REDD-plus negotiations I facilitated, we actually achieved the maximum common denominator in agreeing to consider market and non-market approaches to pay for REDD-plus activities. Such approaches will now be reviewed using environmental integrity, the safeguards and effectiveness in reducing emissions as criteria. The agreement also mainstreams environmental, social and governance safeguards in the area where it matters most — finance. The principle that there should be co-benefits to poverty alleviation, biodiversity, ecosystem services and resilience, indigenous peoples and adaptation has also been established in the decision. An interesting new development is the idea of non-market-based approaches to REDD+ finance, such as a joint adaptation-mitigation mechanism. This was a proposal by one Party and to deal with this, we developed a package that included their proposal and which was eventually accepted by the other countries. Some were concerned that this (a joint adaptation-mitigation/co-benefits approach) was no longer REDD+ but I argued that in the real world, people in fact did see forests more holistically. Aside from the LCA decision on REDD+ Finance, the COP also adopted the Guidance for Forest Reference Levels and for the Safeguards Information System. While falling short of expectations from an environmental integrity point of view, the reference levels decision is an advance as countries now have enough to construct their first reference levels. The safeguards guidance was also criticised by NGOs for not being specific enough to the safeguards but I think this is OK. We should not lock ourselves in guidance that is either impractical or ineffective. There is always a chance to review next year. The next step for REDD+ Finance is identifying modalities and procedures, including payment disbursements. This probably includes considering the market and non-market approaches that are most applicable to REDD+. Offsets are not dealt with in the decision and will obviously be subject to further discussions. Personally, I believe that we should take our time to do this right and not rush into decisions that we could regret as bad for people, forests and climate. The point is that we have sent the signal to investors even if it is not as strong as some would like. Drivers of deforestation will also be a major theme next year in the REDD-plus negotiations as we did not have the time to address this in Durban. It is interesting to know that we had two final stand-offs in the REDD-plus negotiations. By Thursday night, I knew we had an agreement. But some parties insisted on a proposal that effectively would have meant the COP endorsed markets unconditionally, and other Parties fought over language related to national/subnational MRV systems. We finally got all of this sorted out by 3am on Saturday and sent the final text to the Secretariat. Unfortunately, the latter got confused about which was the final text and did not include it in the final LCA text. This in turn angered and confused many parties; to make matters worse, I was already in Johannesburg on my way to Cameroon for a meeting and could not fix things in person. Anyway, it did get sorted out with the LCA Chair reinserting the text verbally during the plenary. I told my colleagues that this was the risk of brinkmanship — we nearly lost the agreement because we held off and waited too long, in my view, to confirm our agreement! It is in the area of overall mitigation that Durban fell short. Although the Kyoto Protocol has been extended with agreement on a second commitment period, it will be a shell of what it was without the United States (which did not ratify the Protocol from the very beginning), Japan, Russia and Canada. It will now essentially be an interim agreement as governments negotiate its replacement. For mitigation then, the real advance is the so-called Durban Platform for Enhanced Action which would “develop a new protocol, another legal instrument or agreed outcome with legal force”. The final words were agreed to at the last minute by the European Union, India, China and the United States in what could be called a negotiating “dance”, which first saw almost all countries lined up against a strange combination of the United States, India and China (who yielded first, because they seem ready to take on legal commitments). The really interesting development in the mandate in the Durban Platform for Enhanced Action is the lack of mention of the principle of “common but differentiated responsibilities” or “equity” in the decision. Does this mean it no longer will guide these negotiations? Since no other principle is mentioned anyway, maybe this has to be settled next year when the terms of reference of the new negotiations are agreed? In any case, for someone like me who drafted the first version of the Berlin Mandate in 1995 when the Philippines chaired the Group of 77 and China and COP1, and who worked with an Indian and Chinese colleague to craft the “no additional commitments by developing countries” in the mandate, this is definitely something to watch out for. This new negotiating process will be launched next year and will culminate in 2015 with the aim of the new agreement taking effect in 2020. Obviously, this is not adequate or precautionary enough to many governments and stakeholders. In fact, this is our last opportunity (if we still have it) to avert a warming of 2-3 degrees or more. If we do not have a strong and legally binding mitigation agreement by 2015, the worst impacts of climate change are likely inevitable. In the last two years, it has become clear to me that the climate change process has become a permanent negotiation. Like world trade, countries will have to deal with this issue regularly. Climate change will not go away and will, unfortunately but rightly so, become increasingly more about adaptation and liability. A new generation of climate change workers — for the negotiations and implementing things on the ground — is thus imperative. That is why, for the Philippines, I am so happy that we have institutionalised the participation of youth delegates in our delegation. Aside from making life easier for us by arranging meetings and reporting on developments, their boundless idealism and energy inspired us veterans to work even harder to achieve the most for the country, for our people, and yes, for nature. Without these young people reminding me of what was at stake, I probably would not have lasted four sleepless and restless days and nights (others in the delegation, including our high officials, went on for six days). When I am asked if I am depressed about the results of Durban, my answer is an emphatic no. We did have a result and made some progress. And with so many young people working with us now on climate change, how could I not say that we made progress on climate change in Durban? You can reach Tony by email, or follow him on Facebook and twitter. DURBAN, South Africa (14 December, 2011)_The U.N. climate change talks in Durban resulted in a mixed bag for REDD+: progress on how to set reference emissions levels, progress on defining how to measure emission reductions stemming from forestry initiatives, but a weak decision on social and environmental safeguards for the program, and no advances on sources of long-term funding, according to CIFOR’s leading climate scientist. “We are now seeing the technical obstacles to REDD fall by the wayside and the decisions made on REDD in Durban are a vote of confidence in the progress that the scientific community has made over the last few years. However, we do not have progress on the ‘politics behind the money’ and without this we cannot talk about sustainability of REDD,” said Louis Verchot, CIFOR Principal Scientist. Erik Solheim, Environment and International Development Minister for Norway, the leading global REDD+ donor, described the forest conservation scheme as the biggest success story so far in global climate change negotiations, but called for countries to be “more daring” in their efforts to cut emissions and slow climate change. The Durban summit, officially the longest UN climate meeting since 1995, was held up due to disputes over a decision to extend commitments under the Kyoto Protocol. While delegates representing 194 nations agreed to a second commitment period beginning in 2013, the legal framework has yet to be decided and no new emission reduction targets were made. However, as confidence in the verification of carbon offsets grows, the private sector may increase their financial support role of REDD+ programs, said Mary Nichols of the California Air Resources Board. California’s recently legislated cap and trade program may allow companies to buy carbon credits to offset part of their emissions from outside the US and allow funding to flow into REDD+ schemes as early as 2015. The negotiations on REDD+ centred around four key areas: finance, safeguards, reference levels, and monitoring, reporting and verifying (MRV) of carbon emissions from forest activities. Progress on safeguards, reference levels, and MRV were achieved quite early in the negotiations, while a piecemeal decision on REDD+ finance only came about after much deliberation. The draft REDD+ text put forward to negotiators last week by the UNFCCC’s ad-hoc working group on the Long-term Cooperative Action (LCA) was light on financing details, with most of the difficult decisions about specific rules that will govern financial mechanisms put off until next year’s climate summit in Qatar (read the LCA’s decision on finance from COP17 here). “There’s going to be submissions of views from the parties, an expert workshop, a technical report by the Secretariat of the UNFCCC, and then all these texts will be put before the COP next year for a draft decision. So we still have one more year of uncertainty to go,” Verchot said. While the REDD+ draft text on finance was accepted quite early in the talks, discussions on whether the next year’s decisions on finance will be based on markets, funds or a combination of possibilities prolonged the negotiations, he said. Due to the delay of a robust decision on long-term finance, Verchot said he believes the talks did little to reduce uncertainty around REDD+ markets. Few observers expect to see a REDD+ market emerge this side of 2020, he said. A major win for REDD+ at Durban was the decision on robust reference emissions levels, Verchot said. This may help REDD+ become similar to the Clean Development Mechanism (CDM), a scheme that allows projects in developing countries to earn emission reduction credits, which can be used by industrialised countries to meet part of their emission reduction targets mandated under the Kyoto Protocol. While there has been some concern that allowing forestry credits into emissions trading schemes could flood the market and see developed countries buying up credits rather than reducing their own emissions, it may provide a critical source of funds for REDD+ developers to help push the scheme forward. Kyoto’s first commitment period excluded forest conservation and avoided deforestation from the CDM, due to major concerns over the enormous monitoring efforts required. However, the development of robust MRV systems will hopefully address this, Verchot said. “It is not clear yet how REDD+ relates to Kyoto because it is not part of the CDM; however, the robust MRV systems that have been achieved may help REDD+ gain access into this mechanism in the future,” he said. However, it is unlikely that discussions around this will begin before 2020, he said, as the EU’s emissions trading scheme (EU-ETS) — the largest multi-national, greenhouse gas emissions trading scheme in the world — “will not consider anything about REDD until 2020”. “With the decision on MRV at Durban, we are one step closer to making REDD+ robust enough to be part of a more comprehensive climate deal,” Verchot said. According to Florence Daviet of the World Resources Institute, the negotiations on safeguards played out in two arenas: technical discussions about guidance for safeguard reporting, and also in the LCA discussions on REDD+ finance (read the decision on safeguards and MRV here). The wording on how developing countries must report how they have implemented social, environmental and governance safeguards has been weakened, Verchot said, adding that this was most likely at the behest of developing countries, many of which lack the capacity to meet complex and costly donor requirements. However, the lack of robust safeguard reporting rules may deter investors who want to ensure projects are properly monitored and do not threaten the rights of forest communities or damage the environment. “There is a clear risk that REDD, without a credible system for safeguards, will not get sufficient funding, neither from public sources nor from private investors,” said Nils Hermann Ranum, head of policy and campaign division at Rainforest Foundation in a recent Reuters report. While the negotiations led to only minimal additional guidance being made available to countries on safeguards, a link between the source and type of financing and safeguards requirements was acknowledged in the LCA’s decision on finance (see paragraphs 63, 64, 66, and 67). “The language is vague, but statements like these link the safeguards and REDD+ finance more closely together … (at least) clearer than it had been in Cancun,” Daviet said. However, it still offers a lot of loopholes due to the weak decision on safeguards, Verchot warned. The biggest challenge going forward with REDD+ is still going to be finance, said Verchot.